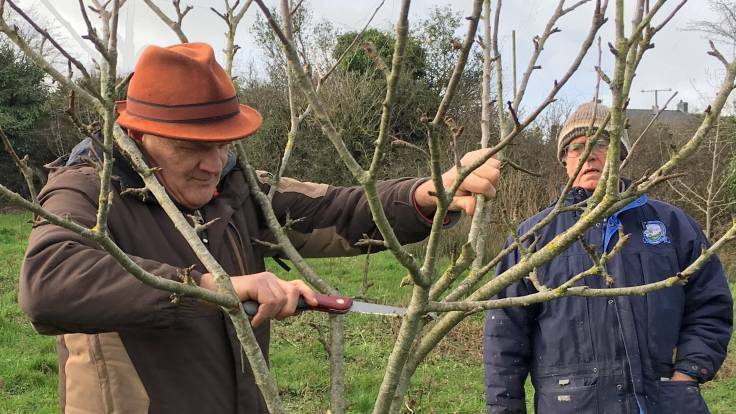 The People’s Orchard put on another pruning and planting workshop today, over at Waun Segur farm in Llandudoch. There was an orchard planted with large M25 rootstock apple trees. The large, cat-like group of volunteers planted some more, including the exotic and possibly unique (pending genetic testing) Poppit Sands apple, found growing wild in the tough conditions of Poppit Sands. I managed to cobble together some notes, which really are for my own benefit but if you can glean any sense or usefulness, all the better. Don’t stake fruit trees unless they are dwarf, ie M26 and smaller (see rootstock reference). Make the smallest hole possible for the root ball when planting. Don’t break up the soil, you want to leave it firm so that the roots can grip and take hold. There were M25 trees there which had been staked, and you could see by rocking them how stunted their root growth was. Half standard tree is one with lower branches raised so that sheep can’t eat them. Martin’s preferred tree sheep is a Christmas Tree Shape for MM106 size and smaller (let large trees do their own thing). The only reference I could quickly find in a cursory search is a PDF called Training and Pruning Fruit Trees from North Carolina State University! For Christmas Tree shape, need to select central leader. Need to make it tallest by cutting back height of competing branches.